Up for review today is the Joya de Nicaragua Cuatro Cinco, a cigar that celebrates the 45th anniversary of the founding of the company. As you can see, the cigar is a beauty to behold–part of the reason I picked it up. But beyond any aesthetic appeal has to be quality and craftsmanship. 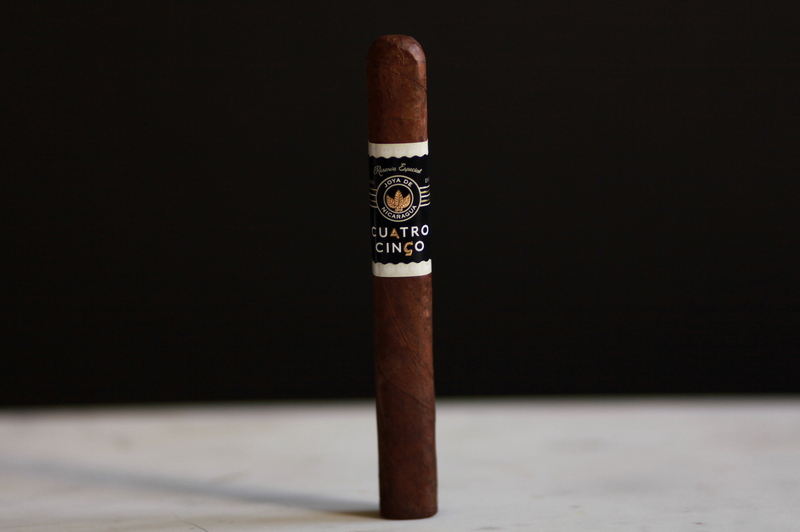 It’s impossible to deny that the Cuatro Cinco is a beautiful cigar. The color of the wrapper plays nicely with the dominant black, white, and gold from the band. The Jalapa wrapper is a deep, rich dark brown with small veins. The texture is sandy, springy when squeezed, and seems to be packed evenly. The pre-light draw has a healthy amount of resistance and I pick up hints of earth, chocolate, and a slight spiciness. Joya de Nicaragua Cuatro Cinco opens with some fun notes of toasted bread, pepper, and an ultra smooth cocoa note that reminds me (at least in terms of consistency) to hot cocoa. Overall, the smoke at this point is medium bodied. The character of the smoke is interesting in that, though it is a very rich smoke, it also activates the tip of my tongue heavily with the spice. One thing I notice is the box pressed format of this cigar makes for a really comfortable smoking experience. An inch in, the burn is sharp and the cigar is producing a lot of smoke. The flavor has also shifted subtly, with the addition of peanuts and an oat-like aroma that I find very enjoyable. In the second third, the spice increases a bit. There’s also an anise note that works well with the rest of the profile. The burn remains sharp, with a solid, white-gray ash. Moving in to the halfway mark, I pick up leather, as well as a saltiness that’s saddled up alongside the pepper. Quite nice. The final third doesn’t change much, but the cigar continues burning smoothing and the burn never wavers. 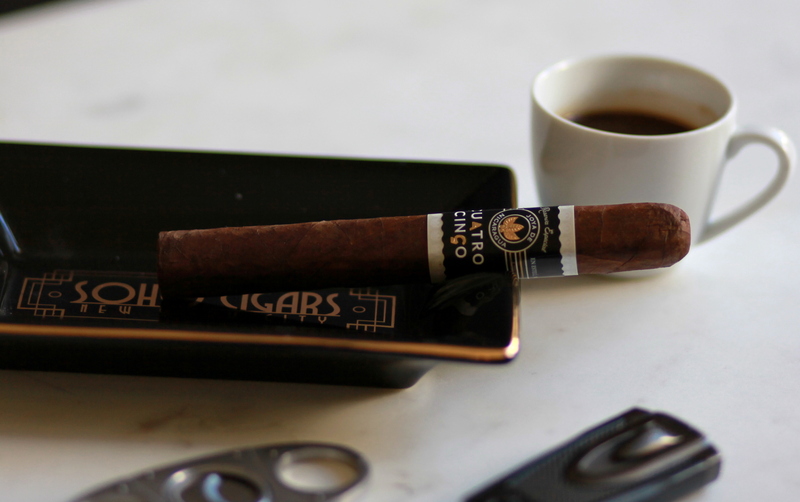 Cuatro Cinco is another great offering from Joya de Nicaragua. The blend showcases a lot of flavors found in other cigars like the Dark Corojo, but offers additional complexity to enhance the experience. But the number of flavors isn’t the only factor: they also have to harmonize with each other. The combination of flavors comes together like a gourmet meal: silky smooth, but rich and chewy. Chocolate, spices, peanuts, and anise. A great combo.